Recently UC San Francisco announced a record $500 million philanthropic gift from the Helen Diller Foundation. Of the total amount, $400 million will go toward endowments, increasing the current UCSF endowment of $2.25 billion by nearly 18%. Tentatively, the Diller gift will be apportioned with $200 million for students in the form of scholarships; $100 million for the Innovation Fund, from which current and future Chancellors can draw; and $200 million will be used to create endowment funds for faculty, half of which will be for junior faculty under the Helen Diller Faculty Scholars to help them launch their academic career. The other half will go to promote and recruit senior faculty through the Helen Diller Distinguished Professorships. The Diller gift is quite unique in that it is not targeted to a recipient or type of work. More than 90% of previous gifts to UCSF have been provided by a donor who wishes to support a specific kind of work, or are from grateful patients who wish to support a clinician they particularly appreciate. So, for the first time, UCSF will receive a very large gift which may be applied in any number of ways. Thus, the UCSF Senate wanted to engage the faculty community to get ideas and priorities for the Diller funds. For February’s Answer of the Month, the Senate reached out to faculty to hear their feedback on the following question: “With respect to funds raised to endow faculty salaries, what do you recommend as priorities for this funding? 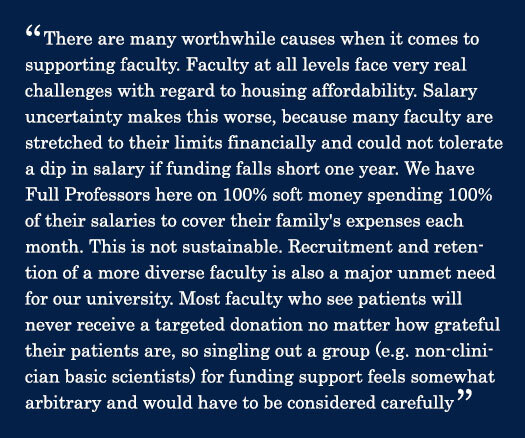 Examples include early career faculty, under-represented minority faculty, and faculty whose field or type of work makes it unlikely a targeted donation would come to them (e.g., an endowment from a grateful patient, etc. ).” We also initiated a task force, led by Chad Christine, Chair of the Academic Planning and Budget Committee to make recommendations regarding priorities for application of the Diller endowment funds. Additionally, the full UCSF Academic Senate Division Meeting on May 11 will focus on finalizing Senate recommendations for prioritizing the Diller gift. Over 490 responses were submitted in response to the February Question of the Month and responses that received three endorsements or more are pictured in the chart below. The diversity in answers reflects the broad spectrum of faculty and their varied foci. Three responses were provided by at least 60 faculty. The leading response (>100 responses) was application of funds for early career faculty, under-represented minority faculty and faculty whose role is such that receipt of endowed funds from a grateful patient is unlikely each received more than 60 endorsements. Funding to support educational effort was also a popular response. The top response--using the funds for early-career or junior faculty – received about 21% of responses. 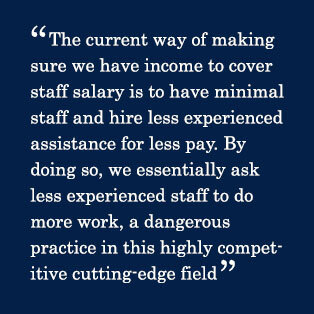 Many respondents voiced concern that the high cost of living in the Bay Area prevents UCSF from attracting outstanding faculty and it also adversely impacts retention. Respondents added that the Diller funds might also be used to provide start-up packages for early-career faculty, housing grants, a loan repayment program, or salary increases, thereby increasing retention at UCSF. Such investment would signal a vested interest in the careers of early career faculty by the University. Others felt that while such an investment might reduce the overall volume of faculty that UCSF could bring on annually, it could over time significantly increase retention. The second most submitted response received about 14% support and favored using the funds for URM faculty. One faculty member commented that recruitment packages be created for URM faculty at all schools and levels. Several voiced a desire for UCSF to promote, attract, and grow their URM faculty representation through recruitment and retention. Other suggestions included: creating a URM faculty development program, funding URM leads in different departments, and establishing equal funding distribution among URM faculty. The third most submitted answer received about 13% of responses focused on those faculty who are unlikely to receive donations. Based on responses, two groups were highlighted. The first concerned those who work in a clinical setting, but do not directly see patients, like those in radiology or pathology. As their direct patient interaction is limited, it makes it difficult to receive patient contributions from wealthy donors. Another group are those faculty at the Zuckerberg San Francisco General Hospital and Trauma Center (ZSFGH) or San Francisco Veterans Affairs Medical Center (SFVAMC), who care for a vulnerable patient population that is not publically insured or uninsured, and do not have the financial means to give large donations or gifts. This provides a challenge for both those in the clinical and research settings at ZSFGH. Providing funds to UCSF faculty at ZSFGH and SFVAMC would help make a community impact and also support advancements in biomedical care and research. A number of responses requested equal distribution of funds across Schools and departments. One comment stated that when funds are not evenly distributed, it becomes unfair. Two comments suggested a solution to this. The first, suggested that if funds were distributed equally in each School, it could be left up to each department chair to decide how funds are used. The second, recommended funding five groups on campus rather than one, including: URM faculty, those unlikely to get a donation, bridging funding gaps, providing full or partial salary support for core facilities, and providing salary support for those who hold a teaching position of 20% or more. Faculty’s requests to bridge funding gaps reflects fear over the future of NIH biomedical research funding. For example, many are concerned that President Trump’s proposal to increase the defense and security budget by nearly $54 billion may cause a decrease to many federal agencies. If the decrease in NIH funding is approved by Congress, then those in biomedical research could suffer. Many responses requested that if NIH funding decreases, the Diller endowment would help cover this gap. Whether only one group on campus within early-career and senior-career will receive funds ultimately rests with the Chancellor, but the APB Diller Task Force will be providing important input to him on this important issue. The Academic Senate recently spoke with Vice Chancellor for University and Alumni Relations and Vice President of the UCSF Foundation, John Ford, who oversees fundraising from private sources in the form of gifts, grants, and philanthropy. As the Vice President of the UCSF Foundation, Ford leads UCSF’s philanthropic efforts and interacts with Helen Diller’s daughter, Jackie Safier. The UCSF Foundation raises funds for the University and determines how to spend income from endowments. “An endowment is money we hold in perpetuity, and that payout is generally 4.25%, so we don’t spend the full $200 million endowment [for faculty all at once],” Ford said. UCSF’s endowment could be used for establishing laboratories, purchasing equipment, hiring graduate or postdoctoral students, and supporting younger faculty towards generating research outcomes in order to attract future National Institutes of Health (NIH) funding. Philanthropic gifts are generally restricted to specific program activities, like funding a specific disease area, research, or training program. Typically, only the donor decides how to spend the funds, but with the Helen Diller gift, some discretion is left to the Chancellor to determine the gift’s allocation. The Chancellor is therefore soliciting feedback from the Faculty including the Academic Senate, which convened a targeted task force. The Endowments Task Force was spearheaded by the Committee on Academic Planning and Budget (APB) and led by Chair Chad Christine, MD, Professor of Clinical Neurology, Parkinson's Disease and Movement Disorders Clinic. “Our overall goal is that the full spectrum of faculty work--basic research, clinical research, and teaching and outreach activities--be eligible for these supported positions,” Christine said. The APB Diller Task Force forwarded its final report’s recommendations to Senate Standing Committees and Faculty Councils for review and comments. This report advocated for the creation of a funding distribution model for the faculty recruitment and retention portion of the fund. The task force encouraged transparency in how the funds are applied and recommended the Vice Provost of Academic Affairs provide a list of eligible faculty for each award every three years on the UCSF website. Beyond that, some other recommendations include specific eligibility requirements, funds allocation guiding principles, selection criteria, and a selection process. They recommended that to be eligible for a distinguished professorship, one must have a minimum 50% appointment or an anticipated 50% appointment at UCSF, in any faculty series, and preference will be given to those at Full or Associate level; a recommendation that differs from the volume of responses provided in the Question of the Month forum. The task force’s guiding principles included seven recommendations. 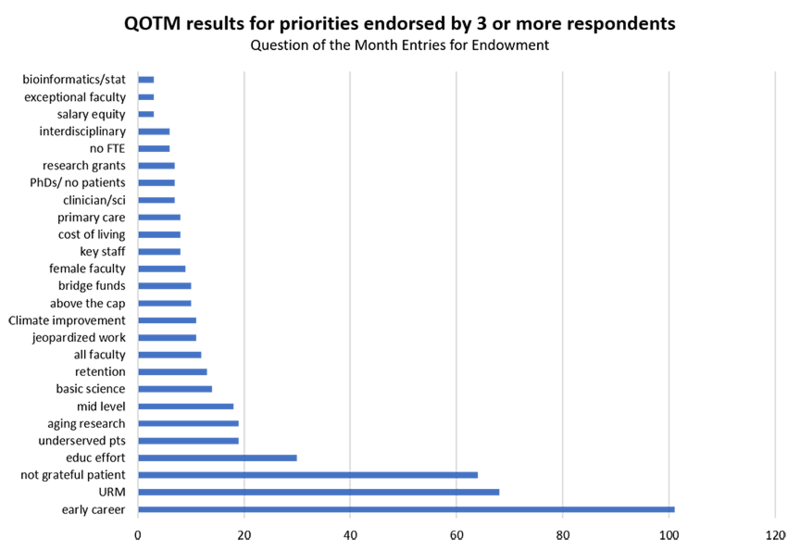 Some of these were fund distribution across all four schools in proportion to number of eligible faculty in each school; a time limitation of five years for distinguished professorships awards that are renewable once for no more than another five years; and a time limitation of 3-5 years for faculty scholars awards with a maximum payout of $450,000 that is not renewable. The selection criteria for distinguished professorships included: scientific, clinical, and education innovators; underrepresented faculty; and those that have made outstanding contributions to the UCSF mission. Some of the recommended selection criteria for faculty scholars include: those involved in interprofessional education, clinician-scientists or full-time scientists, and faculty whose activities are not adequately sustained by clinical revenue or grant support. The recommended selection process is comprised of five steps: annual solicitation from the Chancellor, nomination, applicant review, selection of recipients from a committee comprised of representatives from all four schools, and transparency. After the Task Force assembled its final report, they collected feedback on it from the following Senate Committees: Academic Planning and Budget (APB), Clinical Affairs (CAC), Research (COR), Equal Opportunity (EQOP), Graduate Council, Dentistry Faculty Council, Medicine Faculty Council, and Sustainability. Based on these comments, it was decided that the next step would be to electronically poll faculty on the following four topics: length of funding support, level of financial support, endowment award distribution amongst the Schools, and a ranking of priority criterion. The Helen Diller Foundation is named after Helen Diller, a San Francisco native who was a community leader and philanthropist who focused her efforts on education, science, and the Arts. Born in 1929, Diller passed away in January 2015 and is survived by her husband, Sanford Diller and their three children. Diller also served as the chair of the Bay Area Friends of the Weizmann Institute of Science. Sanford, who founded Prometheus Real Estate, and Diller have used their life to give back to the philanthropic efforts they are passionate about. They have been longtime supporters of UCSF through the Helen Diller Foundation, where Diller served as president. In 2003, they made a $35 million donation towards the building of Mission Bay’s Helen Diller Family Comprehensive Cancer Center and Research Building. They continued to fund the cancer research building through gifts totaling more than $150 million. Additionally, Diller also supported Urology chair Peter Carroll, MD, MPH, in his research over the years. The Diller’s generosity has not just affected UCSF, but they have also supported other schools, parks, playgrounds and museums throughout the Bay Area. Diller’s years of work did not go unnoticed. In 2002, she received the Lifetime Achievement in Philanthropy Award from the Golden Gate Chapter Association of Fundraising Professionals. After her passing in 2015, she received the UCSF Medal for her donations to the health field. Phyllis Cook, executive officer of the Helen Diller Foundation, was interviewed in a recent UCSF News Center article recalling Diller’s humility. Cook said Diller remembered the past, but still lived fully in the present.